end times cafe | being a traveler's account . . .
being a traveler's account . . . This post published simultaneously on Media Screen Turkey. 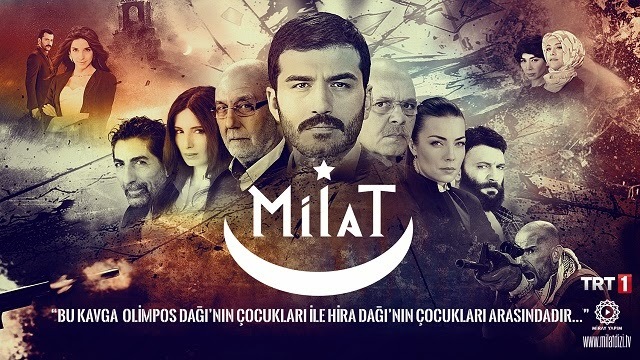 This entry was posted in comment and tagged AK-Party, dizi, fact/fiction, Milat, MIT, nationalism, TRT, TV, Valley of the Wolves on 10 April 2015 by senorfunes. Media Screen Turkey is a blog on the state of media in contemporary Turkey across a range of topics, including cinema, TV, journalism, the arts, and censorship. In addition to 5 Yorumsuz (5 Without Comment), the weekly roundup of some of the biggest developments in Turkish media, the site houses interviews with key figures and commentary on the state of media. New posts are noted at the Twitter handle @mediascrnturkey. The Media Screen Turkey blog is here. This entry was posted in projects and tagged arts, censorship, cinema, film festival, journalism, media, Turkey, TV on 26 March 2015 by senorfunes. The Istanbul Foundation for Culture and Arts (İKSV) Istanbul Film Festival (IFF), Turkey’s biggest both in terms of number of films shown and number of viewers reached, is back for its 34th round from the 4th to the 19th of April, featuring some 204 films by 222 directors from 62 countries. With over 20 categories ranging from horror to children’s films to cinema of the Balkans, as well as numerous competitions and awards, including best domestic feature and documentary, international feature, and best film on the theme of human rights, the festival has something for everyone and, according to director Azize Tan, that’s precisely the goal. 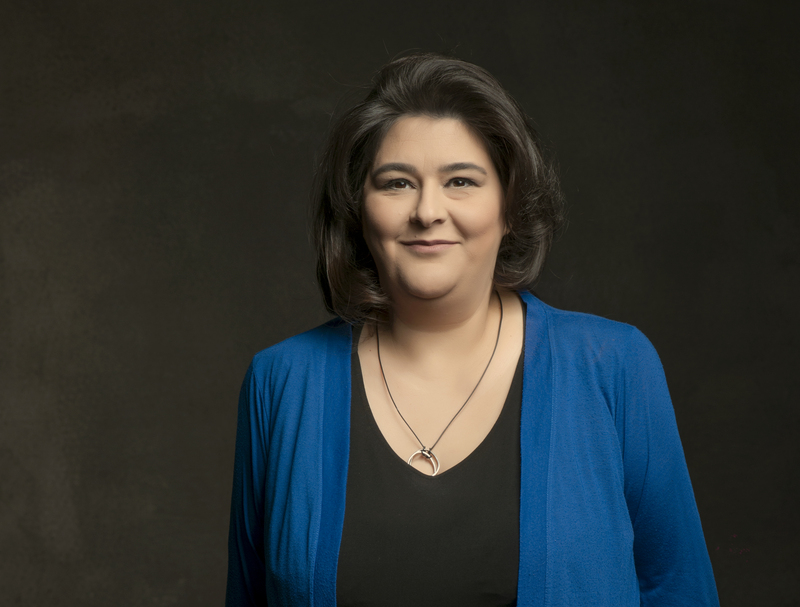 I had a chance to speak with her last fall, during the lead up to IFF’s sister festival, Film Ekimi (Film October – FE), in a discussion ranging from the history of the festivals and their evolving role to the challenges facing the film industry in Turkey. JC – Can you tell me a bit about the history of the two festivals, how they came about, and what distinct roles they have? AT – Well, IKSV (Istanbul Foundation for Culture and Arts) was founded in 1973 by businessmen before there was even a Ministry of Culture. They were organizing a big festival in the summer, quite similar to the one in Edinburgh now, featuring mostly classical music concerts, as well as some theater and dance. In 1982, after the military coup, they decided to screen films at that festival too. It started with just six films, but there was a great interest because cinema was practically dead in Turkey at that time. The cinematheques had been shut down with the coup in 1980 and almost no films were being produced or released, so that was the only place where people could go and see what was happening in world film. The demand was so great that they decided to make it a separate festival. They pushed it to March, and they gave it the name FilmDays. It was like that for almost 10 years, and then it shifted to become International Istanbul Film Festival, as they added an international and national competition. On the 30th anniversary, we decided to drop the title International, since everybody knew the festival was international, so now it’s only IFF. If IFF is a festival for the film world, FE is a festival just for the audience. FilmEkimi started 13 years ago and, just as IFF marks the coming of spring, FE announces arrival of autumn. In fact, this year we did our press conference on the 23rd of September, which is the first day of autumn, and there was a storm and the weather changed in a single day. FE is similar to the gala screenings of the big films at IFF. It’s kind of a “best of” fest, and it’s the right season to do an event like that because summer is quite slow for film in Turkey. October is the time when people start to go back to cinema. If IFF is a festival for the film world, FE is a festival just for the audience. We don’t have any guests, competitions, or industry events. Take a look at the program and if you’re interested in independent or auteur cinema, you’ll find that you can catch up with most of the films that you want to see within the season. FE is organized to get films to viewers while they’re still fresh. If we start the cinema season with Sundance in January and Berlin in February, we get many of those films in IFF. But with films that come to Cannes (May), Venice (September), and Toronto (September), it would be a long time to wait for April to see those films, and many will have been distributed digitally or on pay TV by that point. FE also allows us to follow the films and the directors we’re interested in. So if there’s a director that we’re following throughout his career at IFF, and there’s a new film that can’t wait for April, we include it in FE. That’s how it works. For us it’s a kind of relief, because we don’t lose those films, and it seems to be working very well. In fact, we started our sales on Saturday the 27th after two days advance sales for our loyal members, and by the end of the second day, which is the fourth day in total of sales, we had sold 75% of the tickets. We even had to open 15 additional screenings and extend the festival by a day on either side. We expect an audience of 50,000 people in Istanbul alone. JC – Do you show any Turkish films at FE? AT – Not in the Istanbul program. We do a big showcase of Turkish cinema at IFF, including a number of competitions, and even if a Turkish film has already been released we prefer to leave it until April in order to showcase it for our foreign guests. But FE also has a traveling selection, which varies from city to city, and we do show Turkish films in each edition. For example, the 2014 National Competition Golden Tulip winner I’m Not Him is going to be shown at the traveling festival in Urfa, Diyarbakir, and Trabzon, because the film won’t be released in those cities, but we won’t show it in Istanbul, Ankara, or Izmir because they’ve all scheduled it for release. JC – So it sounds like you’re very careful on the matter of film distribution. Could you say more about the role of festivals as they relate to that? AT – When we started to take the festival on tour it was a collaboration between Sarajevo Film Festival, Sofia Film Festival, Transylvania Film Festival, and ourselves, and we still continue this collaboration. We generally go to cities where there’s a big university and a young audience and our goal is to promote these films. We hold screenings in real movie theaters, not alternative venues, and we project digital, with good subtitles, so the quality is quite high. The project has been very successful and our audience has been increasing steadily each year. We have a very loyal audience, and it’s kind of proved that film festivals are becoming an alternative distribution channel for film. On the other hand, this highlights a problem with the current distribution system as well, because during the normal public releases this audience kind of gets lost. JC – That’s an interesting point about alternative distribution models. Do you coordinate with Başka Sinema (Another Cinema – a new distribution model in Turkey for independent and arthouse cinema)? AT – Yes, we coordinate with them on a number of fronts. We’re all from a generation who grew up with IFF, and it had a big impact on all of our lives. What they are creating is quite parallel to the legacy of IFF in many senses—their special sections and theme nights, for example. In the case of FE, nearly 90% of the films there have a Turkish distributor, and in many cases that is Başka Sinema. In order to defend and sustain independent cinema, we have to collaborate with other parties, otherwise we wouldn’t stand a chance. The Karaca Cinema in Izmir is a good example. It’s in the city center and the owner decided to shut it down. But FE had been holding the festival there for the last four years and we had seen the potential of bringing quality films to that place—in fact, there was a huge demand from Izmir. So we suggested that they collaborate with Başka Sinema and now they’ve got an agreement for the small screen there. We still use the cinema for the festival and now we also promote Başka Sinema with commercials throughout the festival. So far it’s a collaboration that’s helping a cinema to survive. JC – This highlights another aspect of the role of festivals—their effects on the local economy. AT – Yes, when you have a successful festival you can have a major effect. IFF lasts 16 days and includes three weekends, FE is 10 days, and many cinemas that we collaborate with, especially the smaller ones in Beyoğlu, rely heavily on this income to make it through the year. And it’s not only the cinemas that benefit. The face of Istiklal Street changes during the festivals. Different people come here and even the shop owners on the street ask us ‘why don’t you organize a festival every month?’ Our audiences come, they sit, they eat, they spend money. They buy books—well, there are no more book stores left on Istiklal, that’s another story—but I mean we create an economy. JC – Last year we corresponded when IFF chose to screen Nymphomaniac (Lars von Trier) after it was banned by the ratings commission. There were concerns about censorship hitting the festivals in a new way at that point because Cinema Directorate (a subsidiary of the Ministry of Culture and Tourism) head Cem Erkul had written to festival organizers saying that all films would have to go through the ratings procedure, which would mark a major shift in the way festivals worked. Did IFF face any fallout from the choice to show Nymphomaniac or local films without a certificate? AT – The system has to be completely redefined, and instead of a certificate, the existing rating system should be put in effect. The cinema law drafted three years ago will, I believe, help regulate the system and alleviate certain problems, as soon as it is ratified. JC – 2014 is, by some accounts, the 100th anniversary of Turkish cinema. What do you see as the brightest spots and biggest challenges as cinema moves forward? Before MP3 downloads, concerts were not so big. But now with the downloads it’s like albums are dead and the big thing is the concert. I think we are witnessing a similar thing with the film festivals. Now festivals are becoming the big event. AT – You know we’ve been lucky in the sense that our films did pretty well at the festivals. Winning the Golden Palm (Nuri Bilge Ceylan’s Kış Uykusu – Winter Sleep at Cannes) after 34 years was a big success in itself. And then we had Song of My Mother (Erol Mintaş – Kurdish and Turkish titles: Klama dayîka min / Annemin Şarkısı) which won the Sarajevo film festival. And then Sivas (Kaan Müjdeci) at Venice, being a first film selected to the main competition. So in that sense it went pretty well. On the other hand I think we still have a lot to do for Turkish cinema. For example, the main problem is that we’ve been waiting three years for this new cinema law to pass. It’s ready, it’s waiting at parliament, so I think the most urgent thing to do is to pass it. There are new regulations, the system is changing, the industry is changing, and we definitely need a new law. At the same time, the festivals and general distribution will have to redefine themselves. In a way it’s like the music industry. Before MP3 downloads, concerts were not so big. But now with the downloads it’s like albums are dead and the big thing is the concert. I think we are witnessing a similar thing with the film festivals. Now festivals are becoming the big event. So you can come together, see the films together, talk about the films, see the directors, ask them questions, and it’s become something popular. But then we have to redefine regular release in some way. We have to sit down and think about what we are doing and having a film institution at the center of it all would be very useful. I mean everybody is trying to work for the promotion of Turkish cinema, like the festivals, the producers’ association, but I think we need a center to organize all these efforts. Otherwise there are too many people working on the same things and there is no continuity. JC – Something apart from the Cinema Directorate? AT – I mean a structure similar to the establishments in Europe. Someplace to organize everything. The Ministry of Culture is working with different parties for different tasks, but since there is no continuity there is often no follow-up. This year they did good things—Venice proved to b a wonderful opportunity to make our presence felt celebrating the 100th anniversary of Turkish cinema, and we did something big at Cannes, with the stands and everything—but I think for the upcoming years we have to improve. However, these and similar efforts need to be expanded into the whole year. International bonds, once built, must be sustained. The international presence and representation of Turkey must be continuous. A new cinema law, and a film institution to provide continuity are the most urgent, and then we must tackle the problem of distribution with regards to changing windows, like everywhere else. JC – And what is the primary problem of distribution? … we know that 60% of the Turkish box office comes from Turkish films, but it’s only five films that make this number. What happens to the other 65 films? AT – I mean we are talking about successful Turkish cinema. We’ve got about 70 films produced per year, but we don’t know how many of them are going to be released. Or, for example, we know that 60% of the Turkish box office comes from Turkish films, but it’s only five films that make this number. What happens to the other 65 films? We have to talk more about that. We should have a quota for the distribution of Turkish films. And maybe there are too many films being produced in Turkey, that’s something that we have to discuss as well. It’s not only a problem for Turkey either. It’s all of Europe, with the existing funding system. In fact there are 700 films being produced in Europe per year. Is there an audience for so many films? Apparently not. Maybe the focus should be to produce less films, but make them more appealing to the audience in a way. I think for the whole world, not just for Turkey, I think to reach and connect with potential audiences is the first priority. This piece published simultaneously on MediaScreenTurkey. This entry was posted in interview and tagged Baska Sinema, censorship, cinema, distribution, film, film festival, FilmEkimi, IFF, IKSV, interview, Istanbul, Nymphomaniac, Turkey on 18 March 2015 by senorfunes. Today someone purported to be a US soldier was harassed in Istanbul by members of the Turkey Youth Union (Türkiye Genç Birliği – TGB), a nationalist youth group. The group members put a sack over the head of the suspected soldier in what appears to be both a revenge for the 2003 çuval olyaı (hood event, described below) and for more generalized anger at US policies in the region. TGB members published video of their action as seen below. This is not the first time the TGB has taken such action. I include below a brief analysis of the çuval olyaı and some of its significance for US/Turkish relations. This is an excerpt from a larger paper dealing with the US image in Turkey over the last 20 years. Carney, Josh. 2014. “Of babies and burlap bags: key moments and the making of the US image in Turkey.” In K. Kanat, A.S. Tekelioğlu, K. Üstün eds. Change and adaptation in Turkish foreign policy. SETA Foundation, Washington DC, pp. 85-120. The çuval olayı or “hood event” refers to the detention of eleven Turkish Special Forces troops in Sulemaniye, Iraq on July 4, 2003. 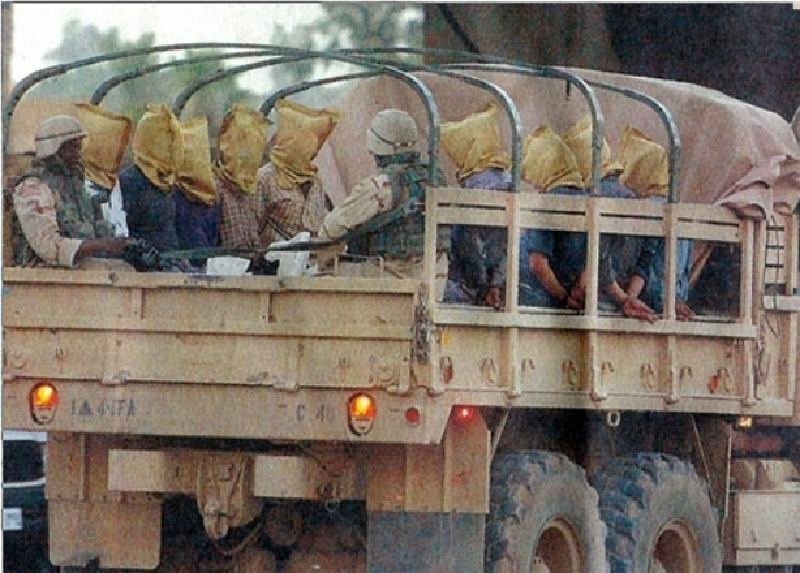 The soldiers, who had burlap bags placed over their heads during the arrest, were taken to Baghdad and released two days later, after intense diplomatic negotiations. The events that led up to the çuval olayı are disputed, at least publicly, with the US alleging that the soldiers were part of a plot to assassinate the governor of Kirkuk, and the Turkish government and military denying this. Neither government has apologized and the event is widely regarded as one of the worst moments in the history of US-Turkey relations. A photo that has come to represent the event depicts eleven people in the back of a military truck. Nine of them have bags over their heads and their hands tied behind their backs. The other two are uniformed soldiers with weapons. The image of the çuval olayı is, however, far greater than this photo. It is a complex including, to use Mitchell’s terms, at the very least verbal and mental images in addition to the graphic. The Turkish press and the Wikileaks cables from the US Embassy are two sources that give some sense of the immediate effects of the event. There are literally hundreds of press articles and columns on the event and it is the direct topic of at least nine embassy cables, though it also figures prominently in many of the embassy press reports released by Wikileaks. Because I am more interested in the long-term circulation of the image, I simply summarize some of the main points from these early sources. The reaction in the Turkish press was universal outrage at the US but, depending on the press source, the relatively new Justice and Development Party (Adalet ve Kalkınma Partisi – AK Party) administration was also often criticized and accused of being soft or incompetent. Some Turkish papers made reference to the 1964 crisis in Cyprus and Lyndon Johnson’s letter of threat to remove NATO support should Turkey intervene, suggesting that this was the worst breach in bilateral relations since that time. Others highlighted the role that Kurdish forces may have played in the event, noting that the raids were certainly aimed at increasing Kurdish power relative to the area’s Turkmen minority. After a few days, some of the papers also began to ask what the Turkish forces were doing in Iraq, out of uniform and with explosives in their base. Overall, however, the tone of the articles was universally hostile to the US. Embassy cables reveal that the State Department staff in Ankara were immediately aware of the potential damage this event could cause, but they do not seem to have had either the speedy access required to speak to US military officials in Iraq or the authority to diffuse the crisis. The cables indicate that AK Party officials felt the event could have been orchestrated by the military to prompt a crisis of confidence, a theory that may be partially supported by the speed with which the event made its way into the Turkish press. Somewhat in contradiction to this claim, however, AK Party officials also pointed to a “silver lining” of the event, suggesting that it would probably weaken the military politically. Such contradictory explanations illustrate three points worthy of immediate remark: first, the emergent nature of the meaning such an event would take on. Like most developing news stories of national importance, the çuval olayı was the subject of ardent speculation on all sides. Its significance was, in a sense, up for grabs. The second point relates to the internal Turkish context in which the event began to circulate: the tension between elected governments and the military that characterized Turkey from at least the 1960 coup up to and beyond the time of the çuval olayı. This tension might be likened to competing strains of a bacterial culture being grown in a petri dish. In the Wikileaks cables, we see US officials aware of these various strains and trying to make some sense of them. Beyond this internal context is a third point of note: the external context of US-Turkey relations at the time of the event. The US invasion of Iraq was immensely unpopular in Turkey, with upwards of 90% of the population having grave misgivings about both the war and President Bush. To continue the metaphor of the culture, the already present animosity towards the US would be the agar—the nutrient mixture on which the various strains are allowed to grow. Without this medium, the story, which quickly began to take shape around concrete images of the US, might have died, but in the gel of the merely four-month-old invasion of Iraq it flourished. 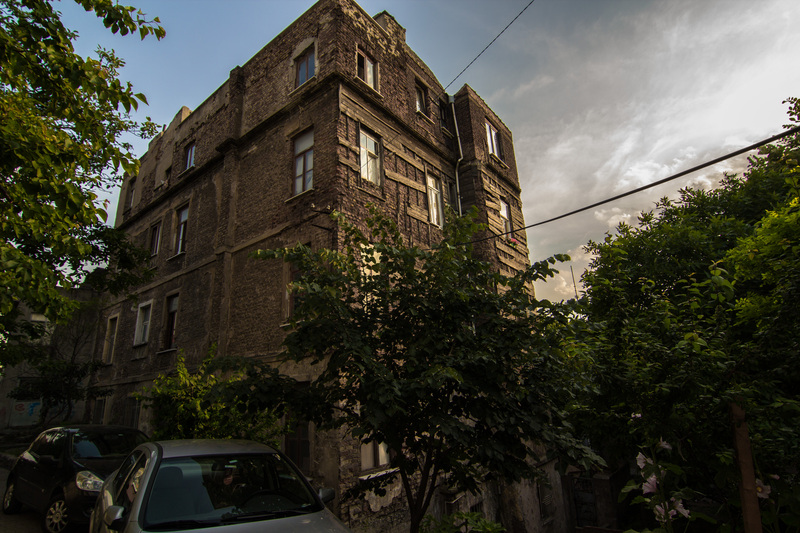 A 2010 post from a nationalist internet forum thread describing the raid is of interest in light of the above observations: “there was no resistance. They surrendered. They were made to lie on the ground. Their hands were tied behind their backs. And bags were put over their heads… I can’t forget that day. I can’t forget those photos. Turkish soldiers being in that state is hidden away like a ghoul in the most obscure corners of my memory.” The description here reads like a description of certain kinds of trauma, and the link between photos and memory here appears to be profound, in some sense supporting Sontag’s claim about people remembering “only” the photographs. Yet the detail of being made to lie on the ground is not shown in the photograph, and the phrase, “I can’t forget that day,” makes this sound almost like an eyewitness account. It may be, then, that the memory of the photograph is supplemented by oral and written accounts of the raid—some of which did come out in the days, months, and years after the event. Of particular interest in this passage, though, is the image that accompanies it. 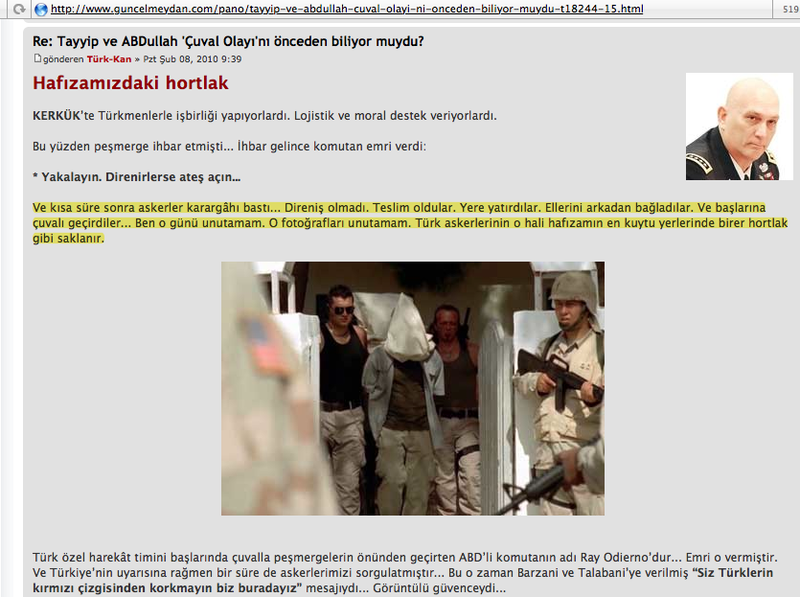 Just under the words “I can’t forget those photos,” is a picture of the Suleymaniye raid, but it is not the photo that circulated in the press: rather, it is a still shot from the 2006 action film Valley of the Wolves Iraq (hereafter designated simply as Iraq). The film, which details the exploits of a Turkish special operations agent who goes to Iraq to get revenge for the çuval olayı, was both the most expensive and the most successful Turkish film in history when it came out. Although the plot is fictional, it is a pastiche of seven different news events related to the US occupation of Iraq that circulated in the Turkish press between 2003 and 2005. Whether or not the person writing this passage was aware that the image he or she had posted and, reportedly, would never forget, was from the film or not calls forth a question about the circulation of images and what constitutes trauma. This question becomes even more interesting when considering the provenance of the more common image of the çuval olayı. That photo, taken by Mikhail Metzel for AP, first appeared in Turkey’s flagship paper Hürriyet on July 12, 2003. Its caption reads: “The day before yesterday American soldiers in Baghdad arrested those who were selling alcohol near the Dide river despite a prohibition, filling up trucks with the sellers as pictured. As with the Turkish soldiers in the Suleymaniye raid, bags were placed over the sellers’ heads and their hands were cuffed behind their backs.” Though the original caption is entirely in line with the AP archive information for the photo, which was taken on July 10th, six days after the çuval olayı, subsequent uses of the photo, especially on the internet, would soon elide the “resemblance” noted here in favor of an indexical interpretation in the Peirceian sense. Now, when the photo appears in the press, it is simply “the” photo of the çuval olayı. Though neither of the images of the çuval olayı we have thus far examined are indexical representations of the event, they are both nonetheless clearly linked to the trauma it aroused. Meek’s notion of historical trauma is useful for understanding this relationship because, as he says, such trauma “cannot ultimately be grounded in any conception of realist representation (even a “traumatic” one) or removed from cultural circulation. Rather it is inherently caught up with the general production of images and narratives in contemporary culture.” That is, the experience of trauma in our heavily mediated age is part and parcel with the acts of mediation that transmit it. To apply this point to the çuval olayı is to suggest that the trauma is neither contained in nor caused by purported photos of the event; neither, at least on the greater social level, is it contained in the experience of those who were there on that day. The historical trauma of the çuval olayı is a shifting reality that moves with the images that are added to it and the way they are received. Whatever its origins, the story of the tea drinking has circulated widely as a verbal image. It was captured neither in photograph nor in film of the fictionalized account, but by the summer of 2009, when I was doing interviews on a related topic, it came up all the time. The analysis of E, the patron of a bookshop in Beşiktaş, was typical. Our topic was the book Metal Storm, a 2004 account of a fictional US invasion of Turkey that was to take place in 2007. Storm mentions the çuval olayı once, but the event is not the overt focus of the book. Nonetheless, E returned to the çuval olayı at least four times during the course of our three-hour conversation and each time he mentioned the tea drinking. His emphasis was on the outrageousness of the US soldiers’ actions rather than on the matter of why the Turks had not fired. It was with a show of near disbelief that he remarked, “Imagine, you’re putting a bag over the head of someone you’d drunk tea with two hours before.” For E, such a circumstance was nearly beyond comprehension, and yet it bore repeating. It may even have been the most salient feature of the event. This addition to the image highlights the living and shifting nature of the çuval olayı in popular memory, suggesting that Meek’s notion of historical trauma is quite relevant, but how does this trauma take shape politically? If we return to the verbal image of US and Turkish soldiers drinking tea together, we can see that one of its key qualities is that it dehumanizes the US soldiers to some degree. They lack the most basic element of honor insofar as they have, according to the image, ignored the social bond of a shared cup of tea. Rather than simply being an opponent, this addition to the image (or, rather, the subtraction of the quality of honor) helps to create out of the US soldier an enemy. We see an amplified case of the same phenomenon in Iraq, where only one US soldier ever questions all the heinous war crimes being committed by his fellow troops, and he is quickly shot by his commander for doing so. Politically speaking, both the tea story and the Iraq film represent a shift in the image complex to the state that DeLuca (1999) calls “imagefare.” Though he does not explicitly define this term, he uses it to refer to political struggle waged primarily through what he calls “image events.” In his use, such events are one of the few recourses of a lesser power (eco-activists, in his case) that has minimal access to the traditional tools of political activism: media, courts, money, and brute force. While it is clear that imagefare need not be (and indeed is not) restricted to the hands of the weak, we can see in both the tea story and the Iraq film a parallel in the sense that the lesser military power—Turkey writ large—exacts a measure of symbolic revenge for actions that are perceived of as wrong. This immediately invites the question of whether such symbolic revenge—perhaps itself a strategy of coping with trauma—is likely to remain symbolic. US Embassy cables reveal that staff were preoccupied by precisely this matter when the film came out: “two concerned outside experts on Turkey told us they were worried that the movie would define the U.S. in the minds of many young Turk [sic]. One remarked that these young people would later perform their military service, and could perhaps comprise the most anti-American generation of Turkish soldiers ever.” That is, those working at the embassy saw the potential for the symbolic images to take on material reality in the form of the next generation of Turks. This concern leads us to the final stop in tracing one particular lineage of the çuval olayı. In October 2011, the youth group Turkey Youth Union (Türkiye Genç Birliği – TGB) “reenacted” the çuval olayı on a US soldier in the southwestern town of Bodrum. This nationalist-Kemalist oriented student organization is committed to defending Turkey from what they perceive as the external threat of imperialism and the internal threats of religious influence. Two of their primary modes of activity are demonstrations and what might be called imagefare. They staged the çuval reenactment with media in mind, taking video and still photos, which were released to the public at a press conference seven months later, and some of which are still available online. Of note is that many of these people were probably between nine and 15 years old at the time of the original event; 12 to 18 at the release of Iraq. What the members of the TGB performed is certainly an image event in DeLuca’s terms: they staged an image production that takes advantage of media cycles in order to put forth a political agenda. Furthermore, from their perspective, this is an agenda of the oppressed relative to US power. Stepping back from this most recent iteration of the image it is worth taking a moment to trace its evolution. It began with a news story that related a traumatic experience for eleven individuals. This trauma affected many Turks who did not know the individuals involved because of its socio-mythical implications—a foreign force negating the power of the sacred Turkish soldier. Though no indexical image of the event has yet come to light, related images nonetheless became instrumental in retelling, (re)living, remembering, and perhaps revenging the trauma, to such a degree in some cases that people who were not directly involved seem to have felt that they witnessed the event. Some of the later images to join the image complex put forth a simplified enemy that becomes a target for emotional and political dissatisfaction, as well as nationalist identification. Ultimately, these trends culminate in a physical manifestation of revenge that is a direct reference to the original event, carried out without regard for the original actors and focusing, rather, primarily on lines of national identity. 109th Congress, “The State of Us-Turkey Relations,” Committee on International Relations, House of Representatives, 11 May 2005; Zeyno Baran, “Patriot Games,” The National Interest Spring(2006); Ioannis N Girgoriadis, “Friends No More? : The Rise of Anti-American Nationalism in Turkey,” The Middle East Journal 64, no. 1 (2010); Aylin Guney, “Anti-Americanism in Turkey: Past and Present,” Middle Eastern Studies 44, no. 3 (2008); Soli Özel, Şuhnaz Yılmaz, and Abdullah Akyüz, “Rebuilding a Partnership: Turkish-American Relations for a New Era, a Turkish Perspective,”(Istanbul: Turkish Industrialists’ and Businessmen’s Association (TÜSİAD), 2009). Wikileaks, “03ankara4278 – 2003-07-08 15:09 – Turkey: Establishment Seethes While Ak Government Maintains Measured Stance on Iraq Incident,” Wikileaks, 30 August 2011; “03ankara4319 – 2003-07-10 04:19 – Turkish Reactions to Iraq Incident: Ak Government Protecting Close Bilateral Ties with U.S.,” Wikileaks, 30 August 2011. “03ankara4240 – 2003-07-07 10:51 – Turkey: Growing Hostility toward Usg in Wak of N. Iraq Incicent,” Wikileaks, 30 August 2011. Nine years later, in the wake of a series of struggles between the AK Party government and the Turkish Armed Forces, the latter claim has come to political fruition in terms of trials such as Balyoz and Ergenekon, which are largely perceived to have reigned in the military. In some popular understandings, this outcome is now seen a deliberate AK Party strategy that began with the çuval olayı. According to a pots and pans seller I spoke with in the Sülimaniye neighborhood of Istanbul in the summer of 2012, the AK Party allowed the event to happen specifically to weaken the image of the military in the public eye. This same man felt that the US had used the event to get back at the Turkish Parliament for refusing to authorize a ground invasion of Iraq through Turkish soil in March 2003. These two explanations would seem to be at odds with each other, as the US take on the March events is that it was an AK Party failure to follow-through on a commitment. That is, the two “causes” purported by this explanation entail antithetical understandings of who was exercising influence over whom. Contradictory explanations are not in short supply with regard to this event, as another informant twisted himself in knots trying to sort the causes out. Though he started by blaming the US, he thought the event was so egregious that no one in the US government or military could be stupid enough as to allow it. He assumed, therefore, that it must have been a counter-agent planted by someone else to harm the US. Since it had harmed the Turks as well, he thought the event should be the topic of a detailed joint investigation. Nasuh Uslu et al., “Turkish Public Opinion toward the United States,” Middle East Review of International Affairs 3, no. 9 (2005). Though global opposition to the Iraq war was high and Turkey, as a both a neighbor and a Muslim majority country, certainly had ample cause to be concerned about such an invasion, an additional element of context is worth mentioning here. The country had suffered immense economic hardship as a result of the 1990 Gulf War and had seen little in the way of US assistance to compensate for this difficulty. Sam Kaplan, The Pedagogical State: Education and the Politics of National Culture in Post-1980 Turkey(Stanford, California: Stanford University Press, 2006); Kerem Öktem, Turkey since 1989: Angry Nation(London: Zed Books Ltd, 2011); Umut Özkırımlı and Spyros Sofos, Tormented by History: Nationalism in Greece and Turkey(London: Hurst Publishers Ltd., 2008). Kaja Silverman, Male Subjectivity at the Margins(New York: Routledge, 1992), 55. Meek, Trauma and Media: Theories, Histories, and Images, 9. Sontag, Regarding the Pain of Others, 70. Türk-Kan, “Re: Tayyip Ve Abdullah ‘Çuval Olayı’nı Önceden Biliyor Muydu? – Hafızamıdaki Hortlak [Re: Did Tayyip and Abdullah Know About the ‘Hood Incident’ Ahead of Time? – the Ghoul in Our Minds],” http://www.guncelmeydan.com/pano/tayyip-ve-abdullah-cuval-olayi-ni-onceden-biliyor-muydu-t18244-15.html. “Direniş olmadı. Teslim oldular. Yere yatırdılar. Ellerini arkadan bağladılar. Ve başlarına çuvalı geçirdiler… Ben o günü unutamam. O fotoğrafları unutamam. Türk askerlerinin o hali hafızamın en kuytu yerlerinde birer hortlak gibi saklanır.” The final sentence might more artfully be translated “The image of Turkish soldiers in that state is hidden away…” I have translated it in the plainer form to avoid over-emphasizing the importance of the image here. Some definitions of trauma refer specifically to the repressing and/or forgetting of the event as an aspect of trauma. In the era of digital media, however, these definitions have begun to shift to encompass the ways in which forgetting may not take place. 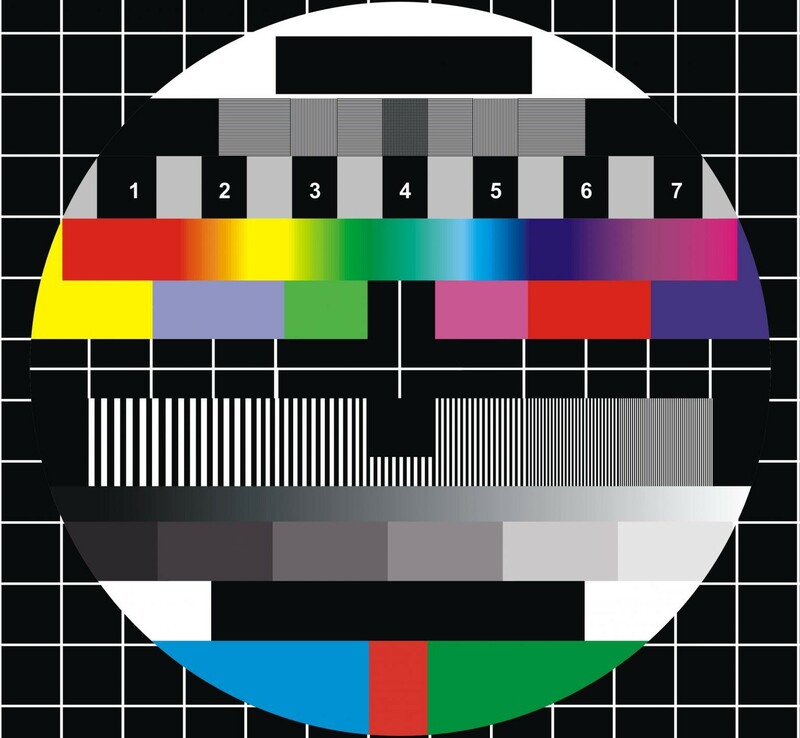 Of some interest here is Sontag’s key distinction between photography and moving pictures: ”Nonstop imagery (television, streaming video, movies) is our surround, but when it comes to remembering, the photograph has the deeper bite. Memory freeze-frames; its basic unit is the single image. In an era of information overload, the photograph provides a quick way of apprehending something and a compact form for memorizing it. The photograph is like a quotation, or a maxim or proverb. Each of us mentally stocks hundreds of photographs, subject to instant recall.” Sontag, Regarding the Pain of Others, 20. Though the image that accompanies the quoted passage is a photograph, it is a still from a film, and it is far from certain which is the more potent medium in this case. This correspondence is the topic of a chapter of my forthcoming dissertation on the blurring of fact and fiction in Turkish popular media. Hürriyet Staff, “Jr Talabani De Filme Çekmiş [Jr Talabani Also Shot a Video],” Hürriyet, 12 July 2003. Bağdat’taki Amerikan askerleri, önceki gün Dide Nehri kenarında yasak olmasına rağmen alkollü içki satan bazı satıcıları kamyonlara doldurup böyle gözaltına aldı. Süleymaniye baskınında Türk askerlerine yapıldığı gibi stıcıların başlarına çuval geçirildi, kolları arkadan kelepçelendi. For example: Taraf Staff, “Sabah Eğitim, Ikindide Baskın [Morning Education, Midafternoon Raid],” Taraf, 4 April 2011. Meek, Trauma and Media: Theories, Histories, and Images, 39. Hürriyet Staff “Çuval Olayı’nın Kilit Ismi Konuştu [Hood Event’s Key Name Spoke],” Hürriyet 18 December 2006. Hiç böyle birşey olacğıını tahmin etmemişler. Çünkü daha önce birlikte çay içmişler ve oturmuşlar. In conversations with the editor and with the authors, however, I learned that the incident was both an inspiration for the writing and one of the events that actually made the publishers think it was a viable project. Wikileaks, “06ankara783 – 2006-02-17 14:44 – Turkey: Valley of the Wolves and Anti-Americanism,” Wikileaks, 30 August 2011. Such concerns were clearly prescient, as subsequent polls have consistently shown that those in Turkey have among the most negative opinions of the US worldwide. For example: Steven Kull et al., “America’s Global Image in the Obama Era,” World Public Opinion: Global Public Opinion on International Affairs, http://www.worldpublicopinion.org/pipa/articles/views_on_countriesregions_bt/623.php?nid=&id=&pnt=623&lb=btvoc; Pew, “Global Unease with Major Powers: Rising Environmental Concern in 47-Nation Survey,”(Pew Global Attitudes Project, 2007); WPO, “Why Turks Feel Threatened by the Us,” World Public Opinion: Global Public Opinion on International Affairs, http://www.worldpublicopinion.org/pipa/articles/brmiddleeastnafricara/393.php?lb=brme&pnt=393&nid=&id=. Eight members of the group are currently on trial for the assault and face potential prison sentences of up to 16 years. This entry was posted in comment and tagged çuval olayı, diplomacy, fact/fiction, image, international, Kurtlar Vadisi, media effects, Turkey, USA, Valley of the Wolves on 12 November 2014 by senorfunes. This past week marked the anniversary of the start of the Gezi Park protests, with an official call issued by Taksim Dayanışma (Taksim Solidarity) to commemorate the events with an assembly in Taksim square on the 31st. The assembly was, in keeping with the promises of Prime Minister Erdoğan and Istanbul Governor Multlu, stiffled by means of 25,000 police officers and 50 TOMAs (water canon vehicles). A friend and I went out to see what was happening and shot the video below from a number of locations. The images I’ve captured here are far less dramatic than others from the day. IMC TV has compiled a set worth viewing (below), and Hürriyet Daily News has a short article on that matter that is worth a look. Over the past year, the use of tear gas and water canons has become so routine in Istanbul and other cities across Turkey that it is almost banal. While these tactics are certainly dangerous and often lead to dire consequences, when you encounter them so frequently you nonetheless acquire a certain everyday attitude towards them. I don’t know if this has anything to do with why police started using live ammunition when struggling against protestors last month, but I suspect it does have something to do with the new strategy they employed for the Gezi anniversary. As I walked back from the market on Saturday morning, I was diverted from my normal road through Taksim by police. Trying to get back home I encountered block after block at which between five and 30 police were congregated on the corners. Around Taksim proper these were the çevik kuvvetleri (riot police) that those who live near Taksim have become so used to seeing in the past year. But on the streets just a few blocks away from the center the situation was different: there were men with black bags, each of which had a large baton protruding from it. As we would later learn, the bags contained at least three other items: a gas mask, a reflective vest, and a blue baseball cap. These are the uniforms and tools of the latest addition to Istanbul’s police force. Thousands upon thousands of them. The baton is their primary tool and they did not hesitate to use it on the 31st. The video below provides a brief example of what many experienced on that day. There are two striking (pardon the pun) facets to this new order. First, is the return to the brute and direct one-on-one physicality. In an age of ever-growing technology for policing dissent, making the baton the weapon of first resort is an interesting choice, as the mentality of violence would seem to be different in one-on-one (or seven-on-one) encounters. There is no possibility for the person wielding the baton to deny the direct physical harm he or she is causing. Second, and of extreme practical importance, is the anonymity of these forces. They bear no visible badge, and, unlike the riot police, no number on their helmet by which to be identified. Given that their task appears to be one of direct intimidation by brute force, the matter of identity and, thus, accountability, would seem to be of the utmost importance. Its absence is an ominous sign for the times to come. This entry was posted in a/v, comment and tagged Gezi Park, Istanbul, police, protest, Turkey, violence on 3 June 2014 by senorfunes. Stepping out for a run the other day I encountered the sign at left along Tarlabaşı Caddesi, the primary auto artery between Istanbul’s historical peninsula and Taksim. This is a new image, but the billboard seems to be owned by the IHH (İnsan Hak ve Hürriyetleri ve İnsani Yardım Vakfı — Humanitarian Relief Foundation), as it always carries an image with their logo. The IHH is the organization responsible for organizing the Mavi Marmara aid flotilla to Gaza in 2010, and this new billboard commemorates the four-year anniversary of the Israeli raid on that flotilla that resulted in the death of nine Turks, one of whom was also a US citizen. (A tenth Turk died last week of wounds received during the raid, after spending four years in the hospital.) The sign says “we’re marching towards freedom” and it tells viewers about a commemoration march from Sultanahmet Square, the heart of Ottoman Istanbul, on 31 May. The anniversary of the raid was marked with more than a march. Former Turkish ambassador to Israel, Oğuz Çelikkol, released a book detailing the crisis in Turkish-Isreali relations between 2009 and 2010 a week before the commemoration. Days later, a Turkish court ordered the arrest of four Israeli officers involved in the raid, sending warrants to Interpol since the officers have refused to appear at any of the hearings. And, with just three days till the anniversary, news came out that the name of the Mavi Marmara had been changed to Gazi M — a shift suggesting the symbolic significance the ship has taken on. “Gazi” translates as “veteran.” It’s a term of respect, and one that often carries a religious connotation. Clearly, there was a concerted effort to commemorate this major political event and this is not surprising. 31 May was not only the anniversary of the flotilla raid, it was also the first anniversary of the Gezi Park uprising. Though the protests actually started on 28 May, it was on the 31st that they became a nationwide phenomenon, and this is the day that was chosen by Taksim Dayanışması (Taksim Solidarity), one of the organizers of the original protests, to commemorate the event. They issued a call for people to come to Taksim on the 31st. Taksim Solidarity poster stating “we’re in the square on 31 May” (Taksim dayanışması). Among the smaller words that comprise the image the names of various people killed in last year’s protests are prominent, as are references to Turkey’s recent mining disaster in Soma. 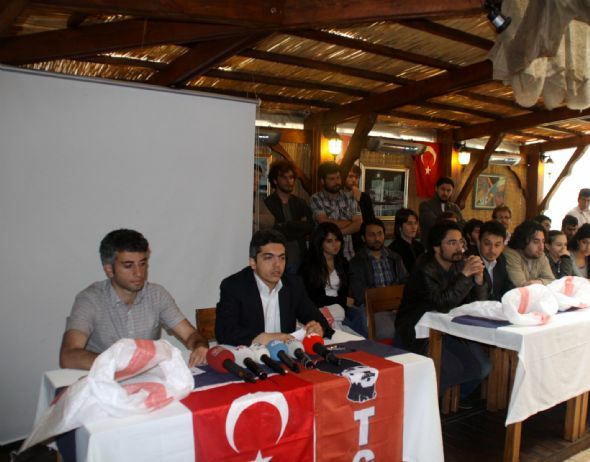 As in the case with the flotilla raid, the anniversary of Gezi was marked by a number of groups and parties. A guerrilla photo exhibition took place at various sites around Taksim in the weeks leading up to the event (illustration below), a collective art exhibit commemorating Gezi opened up at two galleries in the area on the 28th, and a group of comic artists and fans recently started a kickstarter campaign to fund an anthology of cartoons and graphics related to the protests. 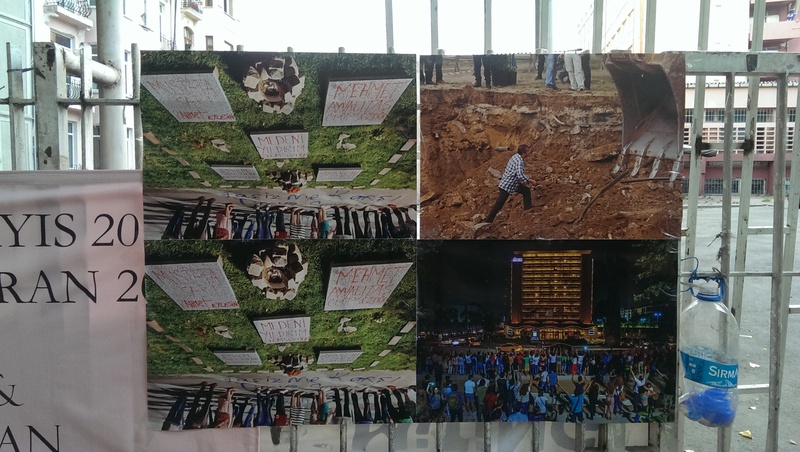 Example of the guerrilla photo exhibit that has been taking place in central Istanbul recently. These photos appeared on a fence along Sıraselviler Caddesi, one of the prominent sites of struggle between protestors and police last year. 24 May 2014 (Josh Carney). Beyond these artistic commemorations, the recent spate of political unrest in Istanbul can in some ways be seen as a continuation of Gezi, and in some ways as an anticipation of the anniversary. A demonstration that ended in two deaths was initiated in part as call to commemorate Berkin Elvan, a 15-year-old boy who was killed by a gas canister fired by police during Gezi. Also at issue was the government mishandling of the mine disaster at Soma that killed over 300 people, making it the deadliest in Turkish history. While the connection between Soma and Gezi is not necessarily organic, some have noted that both the disaster and the protests highlight the problems of Turkey’s current neoliberal governmental regime. Taksim Dayanışma clearly took up with this cause, incorporating numerous references to Soma and mining in the small words that compose “meydandayiz” (“we’re in the square”). For those who have observed Turkish politics over the last year, it will come as little surprise that the call to assemble in Taksim was not welcomed by the Turkish government. Days before the 31st, Istanbul Governor Hüseyin Avni Mutlu stated that such a demonstration would not be tolerated, and that 25,000 police and 50 TOMAs (tank-like water canon vehicles) would be present in the area to prevent such activity. This was followed by PM Erdoğan’s statement that the police were not to allow protestors to enter Taksim or Gezi Park under any circumstances. And thus we were confronted with a rather striking situation: two anniversaries at the two most prominent squares in Istanbul, and two very different approaches taken by the government. The Sultanahmet rally was allowed and perhaps tacitly encouraged by the AK-Party, as the politics of the party and the IHH align quite closely. The Taksim rally was actively and violently and stamped out. (A brief note about that in the follow-up post to this one.) A politics of place is hard to ignore in this situation, and it is certainly one aspect of the context, so I will address it briefly. Sultanahmet is steeped in the Ottoman legacy, which the AK-Party has increasingly come to adopt as its own. Last year, the square took on a pan-Islamic character, as it was home to a rally in support of (then) Egyptian President and Muslim Brotherhood leader, Muhammed Mursi. (A march in Taksim on the same day, 6 July, was prevented by police.) 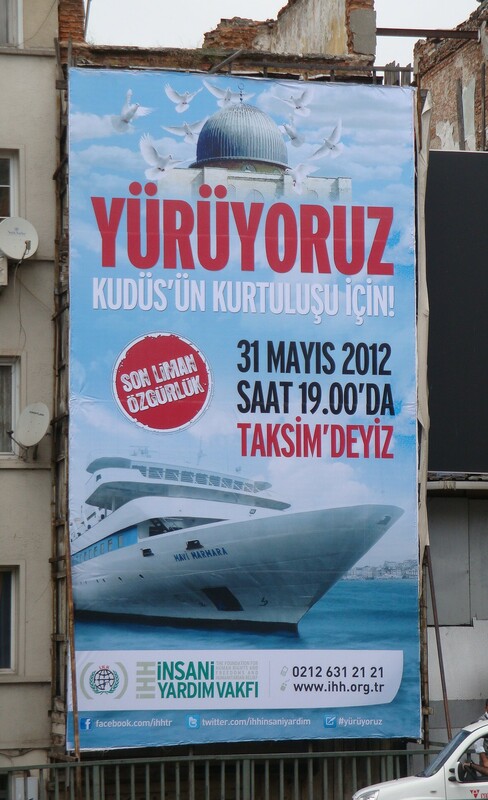 The IHH poster obviously works with this pan-Islamic sentiment, as an image of the Al-Aqsa Mosque in Jerusalem hovers over the Mavi Marmara, indicating a religious cause for the flotilla and, by implication, the anniversary demonstration. This religious sentiment is tied to Sultanahmet for a number of reasons, but two of the most obvious are architectural. The square is home to both the Aya Sofya (Hagia Sophia) and the Sultanahmet Mosque among its many treasures. On Saturday, the rally for the Mavi Marmara was preceded by an early morning prayer in front of the Aya Sofya attended by thousands. This event was not, strictly speaking, in conjunction with the flotilla commemoration but was, rather, the latest in an increasingly active campaign to have the status of the Aya Sofya, currently a museum, shifted to that of a mosque. The event was timed on the weekend closest to the 29th of May — the date in 1453 on which Constantinople was conquered and the Hagia Sophia, which had served as a Christian church since the 6th Century, was turned into a mosque. Taksim, on the other hand, is defined, in spatial terms at least, by the Republic Monument on one side and the Atatürk Cultural Center on the other: both prominent markers of the Turkish republican and secular legacy. It was at least in part for this reason that the plans to (re)build an Ottoman-barracks-themed shopping center and a new mosque next to the square aroused such discontent. More generally speaking, Beyoğlu, the part of the city centered on Taksim, was historically the center of non-Muslim Istanbul, housing first trade colonies and, eventually, many foreign embassies, particularly of “western” countries during the Ottoman period. This state of affairs lingered on in the early republic until a series of tax penalties, ethnically charged pogroms, and government expropriation programs took place from the 1940s through the 1960s, forcing many non-Muslims to leave the country. Taksim has, more recently, had the historical legacy of being the meeting place for labor parties and leftists, particularly on May Day. In 1977, it was the site of a May-day massacre that ended in the deaths of at least 34 people. The perpetrators, presumed to be right-wing militias working in concert with the government, have never been caught. As striking as this politics of place may be, neither Sultanahmet nor Taksim can be contained within the ideological borders I have sketched above — both places supersede these meanings on countless fronts while nonetheless being steeped in the legacies that I’ve highlighted. A simple enough example of this can be found in the image below. It’s a 2012 billboard from the exact same location as the one with which I began this post, and it has a very similar message and motivation. In this case, the Al-Aqsa Mosque is pictured but not mentioned with text. This image tells us that the IHH was marking the anniversary two years ago as well, but, with one crucial difference: that time the march took place in Taksim. Places and public squares, like the movements that travel through them, the ideologies that briefly inhabit them, surely don and slough meaning with the times. It would be inconceivable for the IHH to hold a demonstration in Taksim today, given the way Prime Minister Erdoğan, with the willing help of an increasingly propagandistic media, has stigmatized the space and the people who wish to use it for anything other than shopping. But two short years ago, when the Mavi Marmara was still a cause that tended to unite rather than divide people in Turkey, Taksim was the clear place for the rally. And, it should go without saying, the space was available for such a cause. What Turkey has lost in these two years is immeasurable: the population is deeply divided not only in terms of the direction the country is taking, but even over the most basic notions of what constitutes truth. It would be difficult to exaggerate the role of media in this state of affairs. Tensions are high, the economy is fragile, and notion of Turkey as a beacon of democracy for the Muslim-majority world has been tarnished beyond repair. Sections of cities across the country are ruled as a police state in which violence has become normalized to the point of banality. This is simply a description of the country’s current state; it is true regardless of where one stands politically. For those who wish to change this state of affairs there have been gains in the past two years as well. Gezi politicized a generation and brought out a creative approach to political engagement that is still developing. Perhaps more importantly, it encouraged a spirit of openness to others that had not before been seen in Turkey. In as much as the population here has been divided, coalitions between extremely unlikely allies have also been formed. Perhaps the clearest challenge ahead is to broaden this coalition. In all likelihood 31 May 2015 will, once again, see the commemoration of these two key political events: probably, once again, in Sultanahmet and Taksim. The IHH billboard stands prominently on the main road connecting these two squares. The task for the year to come may be one of imagining and then creating a state in which these public spaces and public commemorations could be brought together, (re)connecting the squares and the people who come to occupy them for the day. BACK TO POST 1: A recent example is their move to re-introduce Ottoman-era tuğras, or Sultanic seals, at public monuments. I note this without the disdain that some of my more secularist Turkish friends might assume — the move to obliterate the Ottoman legacy at the dawn of the republic was clearly overzealous and it is good to see some moves to compensate for that from a historical perspective. The political dimension of this move is considerably less laudable in my opinion. This entry was posted in comment and tagged Gezi Park, IHH, Mavi Marmara, public square, Sultanahmet, Taksim, Turkey on 3 June 2014 by senorfunes. Preliminary web site for the project here. This entry was posted in projects on 28 May 2014 by senorfunes.